Sometimes I hesitate posting recipes on the blog that are too simple. However, sometimes we’ll keep making the same simple dish over and over and that’s when I know I need to share it. This summer is definitely the summer of simplicity when it comes to cooking. We’ve had two weeks of extreme heat and drought and it’s sucking all of the energy out of us. Thankfully, with a few fresh ingredients we can continue to eat well with minimal effort. This radish salad is a lovely side dish when served alonside grilled meat, fish, pasta or even bulked up with some shredded chicken or avocado so it can stand in as a complete meal. I was inspired to make this after skimming through the most recent Bon Appétit magazine where they highlight a shaved radish salad with mint and walnuts. This is a different version but uses the same basic method of minimal ingredients with bold flavors. I hope you all enjoy this salad as much as we do. We’ve been making it almost every day for the past week and I don’t see any end in sight! Whisk together the oil, lemon juice, salt and pepper in a bowl or shake in a resealable jar to emulsify. Set aside. In a small dry skillet over medium heat toast the sunflower seeds, shaking the pan often, until golden brown, about 5 minutes. 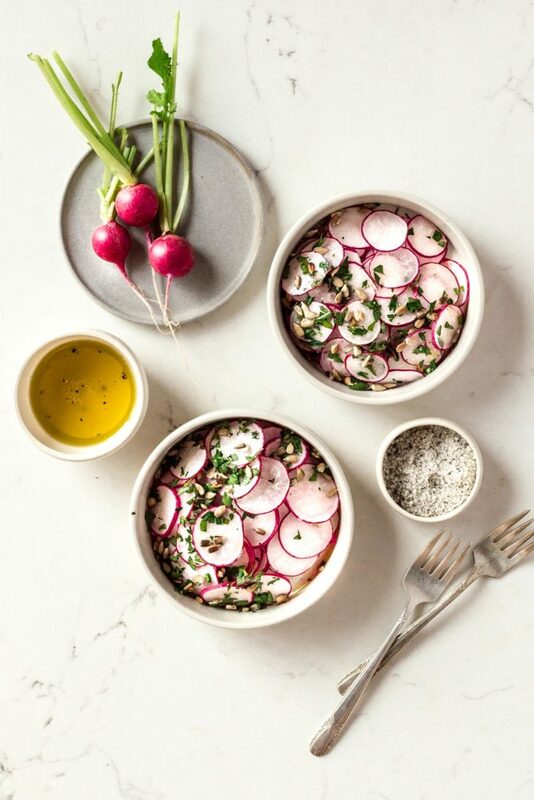 Place the radishes in a large bowl and drizzle with the vinaigrette (you'll have leftover dressing). Toss until evenly coated. Divide the radishes between plates and top with the toasted sunflower seeds, parsley, and flakey sea salt. I don’t mind minimal recipes at all. In fact, it makes me happier seeing them, because 1. their well, simpler to make and 2. more natural! This sounds like such a lovely Summer salad! You can never go too simple. And that’s why I love your recipes. Thanks for the inspiration, always.